Invasive species. Algal blooms. Water diversion. Microplastics. Rising concentrations of pharmaceuticals. Risk of pollution from oil pipelines. When asked, “In your opinion, what is the single biggest threat to the Great Lakes?” Ashley Wallis responded with an intimidating list. Ashley, the Water Program Manager at Environmental Defence, and her colleague (and OLIP alumnus) Patrick DeRochie, Energy Program Manager, sat down with us last week to tell us about their work and the environmental challenges they see Ontario facing. Environmental Defence is a non-partisan, non-government organization pursuing action by the public, businesses, and the government on four sets of issues: freshwater protection, climate change, healthy urban planning, and protecting consumers from harmful chemicals. There is no single solution to all the threats faced by the Great Lakes, according to Ashley. She described how inter-jurisdictional collaboration among federal governments, states and provinces, and municipalities on both sides of the Canada – United States border is a necessary starting place, as is ensuring that Indigenous nations – who have relied upon the Great Lakes for food, drinking water, and transportation since time immemorial – are able to participate fully. In 2016 the governments of Canada and the United States committed to a 40% reduction in the amount of phosphorous – a driving factor causing algal blooms – entering Lake Erie, though the success of this initiative remains to be seen. Microplastics are another issue of concern for the Great Lakes, as they may impact human wellbeing as well as the health of marine animals and ecosystems. Ashley described how Ontario has the lowest plastic bottle recycling rate in the country, and alongside Manitoba is among the only two provinces without a deposit return system for plastic bottles. Environmental Defence is advocating for the creation of such a system in Ontario, with the dual goals of reducing the amount of plastic waste ending up in marine ecosystems and generating revenues (from unclaimed deposits) that can be directed towards environmental remediation efforts. Like Ashley, Patrick’s work takes place on multiple fronts. In his role as Energy Program Manager, Patrick helped governments across Canada adopt carbon pricing systems, including the cap and trade program here in Ontario. He participated in the political opposition to the Energy East pipeline, and is currently exploring ways in which environmental law can be reformed. Lastly, he is involved in initiatives that bring together blue collar workers and climate advocates, for the purpose of highlighting areas of joint interest. This search for common ground also occurs in the political realm. Patrick described how he meets with political leaders from across the political spectrum, and that common cause may be found because of issues like local food, greenspace, and hunting. This meeting left us with much to think about, from the state of Ontario’s environment to the best way to build coalitions around particular issues. Thank you again to Ashley and Patrick for sharing their insights! It is a busy day at Queen’s Park, and a small knot of people stand in the hallway of the second floor of the legislature discussing what it takes to be a Minister, current issues falling under the domain of Government and Consumer Services, and the unique riding of Pickering – Scarborough East. The Honourable Tracy MacCharles kindly took time out of her day to share her reflections on seven years of holding elected office. Serving as Minister of Government and Consumer Services is just the latest in a career has had many twists and turns. 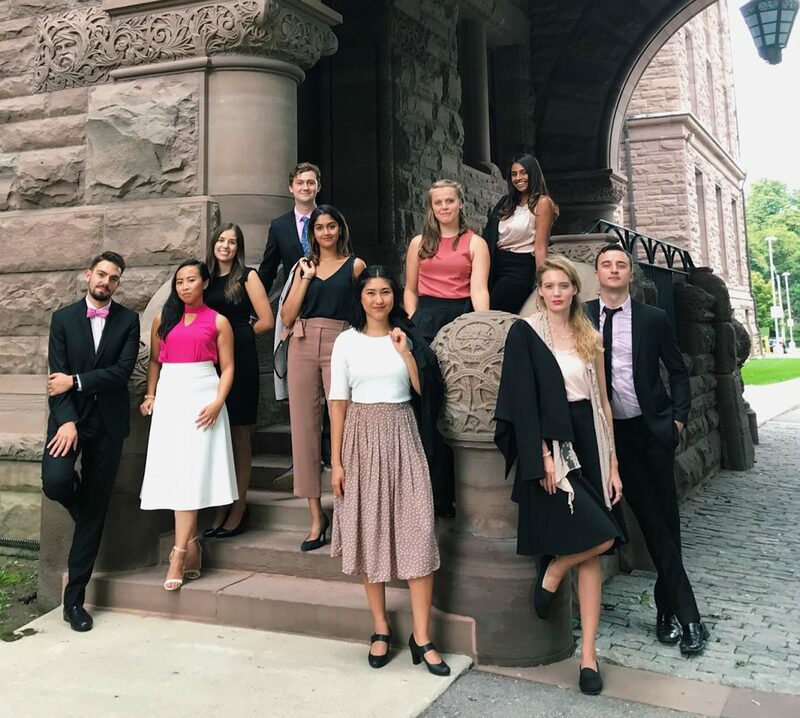 Starting out as an intern with the Ontario Public Service, Minister MacCharles worked for ten years as a civil servant — including a stint in the Ministry for Government and Consumer Services — before transitioning to the private sector. She worked as the human resources Vice President at Manulife, eventually going on to start her own human resources firm. Her political career began in 2011 to represent the riding of Pickering – Scarborough East. Since then she has served as both the Parliamentary Assistant and Minister of Children and Youth Services, as well as the Minister Responsible for Women’s Issues. Today, in addition to Government and Consumer Services, she also the Minister Responsible for Accessibility. During our wide-ranging hallway discussion, Minister MacCharles spoke about having a good understanding of how government works is essential for a Minister. She also praised the initiative of fellow caucus members who have introduced private member’s legislation falling under the purview of Government and Consumer Services. The Minister described how she has worked with the aim of making Ontario a national leader on issues such as gender identity – it is now possible for those who identify as non-binary to get a driver’s license with “X” instead of “F” or “M”. Another area in which she sees Ontario leading is accessibility, and she is proud to help support the implementation of the Accessibility for Ontarians with Disabilities Act, 2005. Minister MacCharles also spoke about her riding, Pickering – Scarborough East. It is unique because it is bisected by the City of Toronto boundary, and therefore encompasses part of Scarborough in the East and the City of Pickering in the West. The duality of her riding gives her two distinctive perspectives, and she makes a point of being present for both her Pickering and Scarborough constituents. We’d very much like to thank the Hon. Tracy MacCharles for taking the time to speak with us, and we wish her all the best on the next stage of her career!